Spiders (Class Arachnida) are animals that, often times, get a bad reputation. Some people find them creepy, dangerous, menacing, etc. While there are some species that do present a danger to humans due to their venom (black widow, brown recluse), most spiders are beneficial and a crucial part of the ecosystem. Spiders are carnivores whose prey includes many species of insects, thus keeping their populations in check. This is especially important for agricultural crops. Simply put, without spiders, swarms of vegetable-devouring insects would overwhelm much of the world food supply. In addition, they also eat mosquitoes and flies, which can carry diseases. On top of that, many of the things that spiders produce such as venom and silk are being used in innovative ways in the medical and engineering fields, respectively. 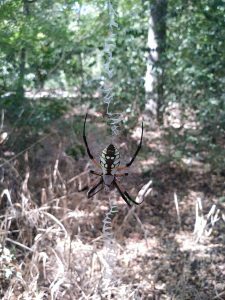 Here at River Legacy, there are dozens upon dozens of spider species. As you walk around our trails, take a close look at the dozens of spider webs that can be seen throughout the forest. If you see a web that looks like a funnel and it is very close to the ground, it likely was made by a grass spider (Genus Agelenopsis). Orb weavers (Family Araneidae), including the yellow garden spider (Argiope aurantia) (pictured), and wolf spiders (Family Lycosidae) are also very common.